We started our day in the Triana neighbourhood. 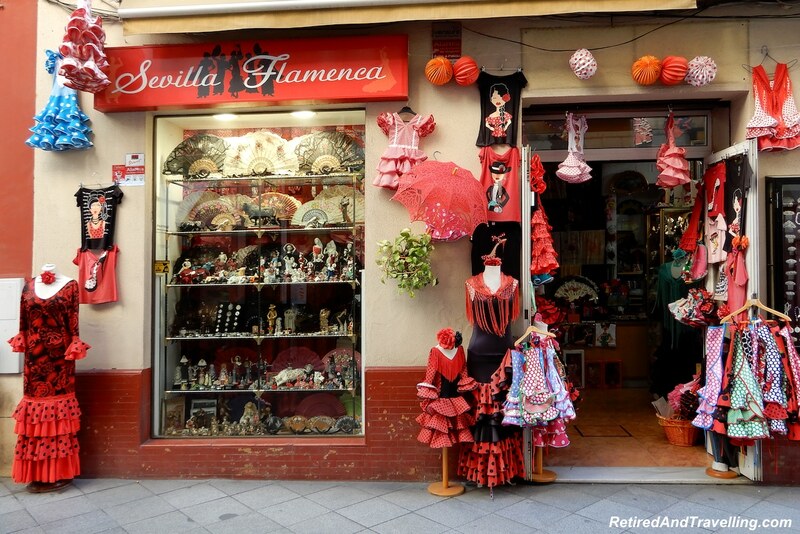 It is said that flamenco dancing comes from Triana. So it seemed a fitting beginning to our evening of flamenco and food in Seville. Our tour guide David from Devour Seville was waiting for us under the statue when we arrived at Plaza Neuvo. 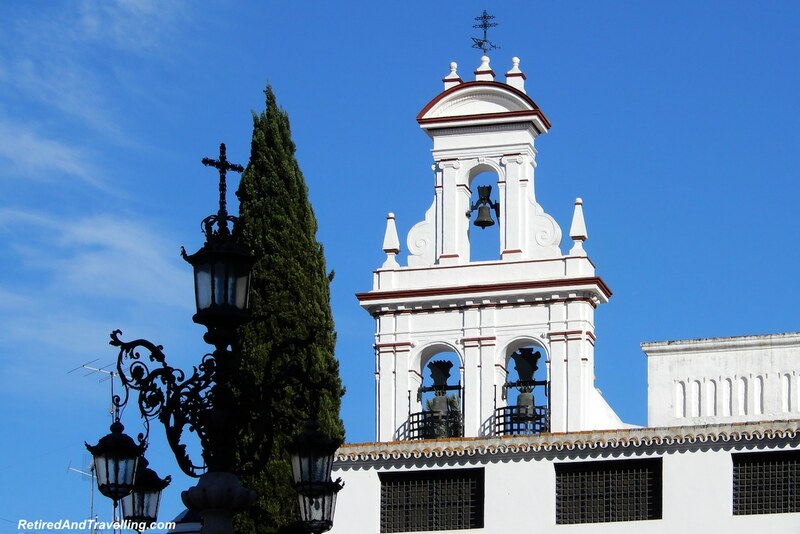 David was an Australian who had moved to Seville and adopted it whole heartedly. A family of 3 from Tucson joined us. 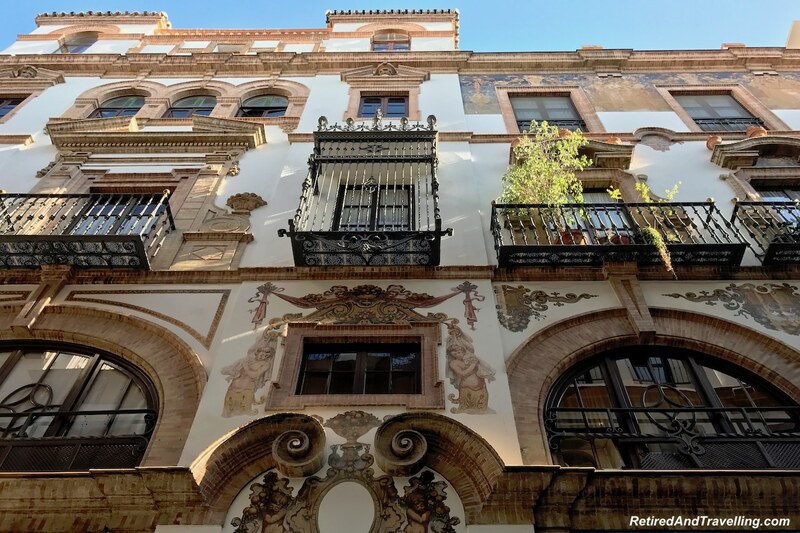 We would have a small group of 6 to wander the streets of Seville in search of great food and music. A great way to finish our 4 days in Seville. 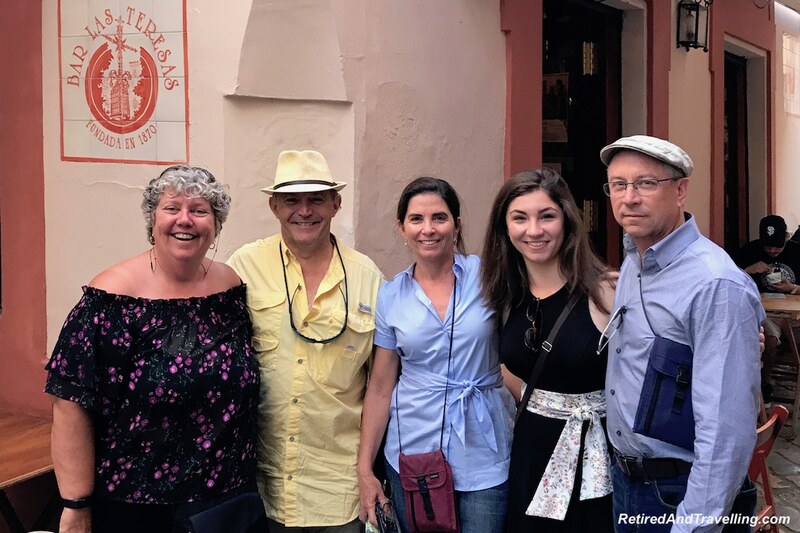 At several points through the flamenco and food in Seville tour, our guide David would stop to give us a little more information on the history and traditions of flamenco. 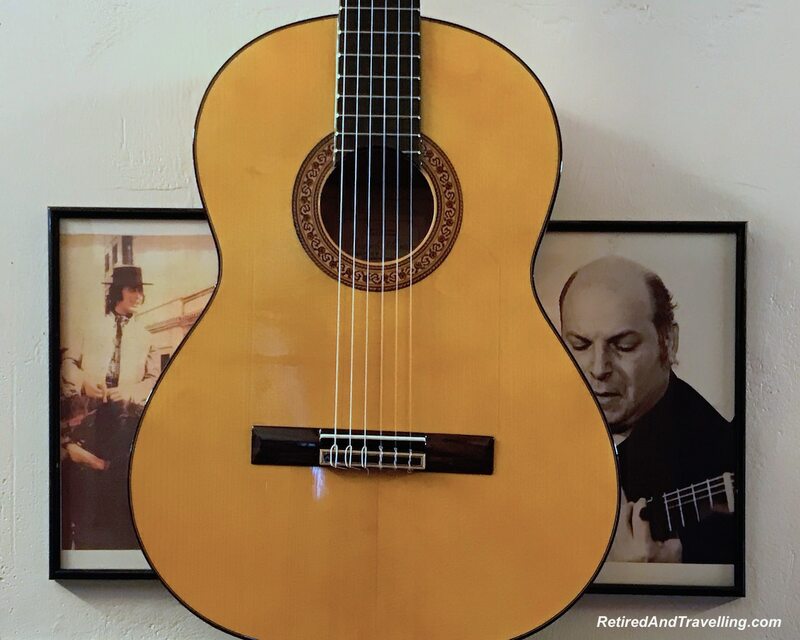 Flamenco is not just the dancing! 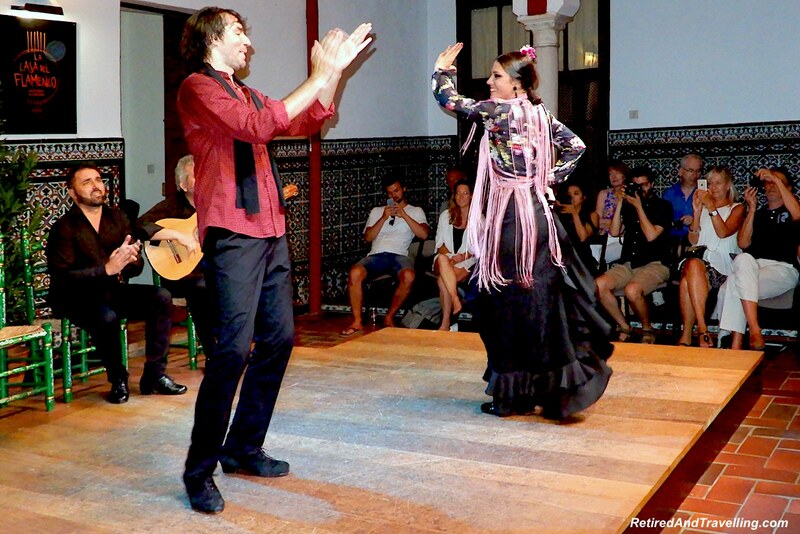 There are 3 elements to flamenco – the guitar player, the seated singer and the flamenco dancers. 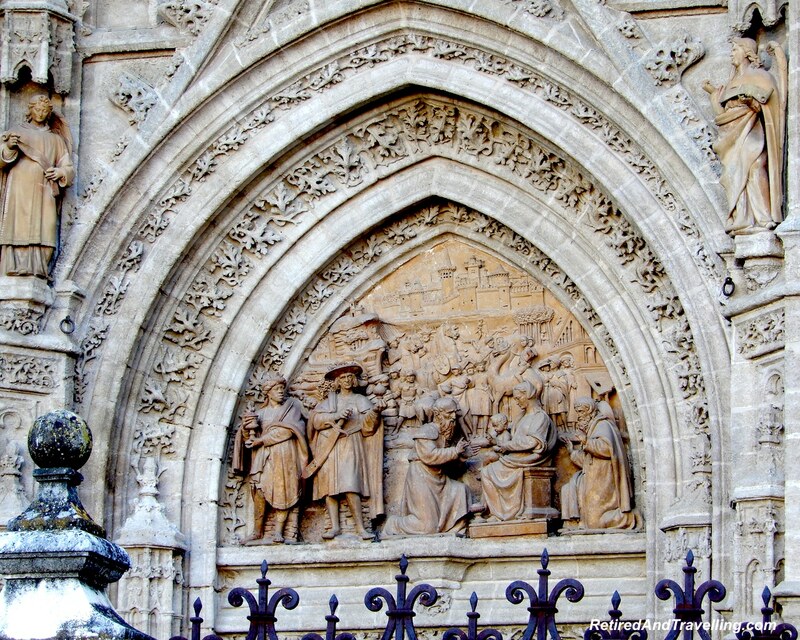 The Moors first introduced guitars to Spain. They have evolved over the years. 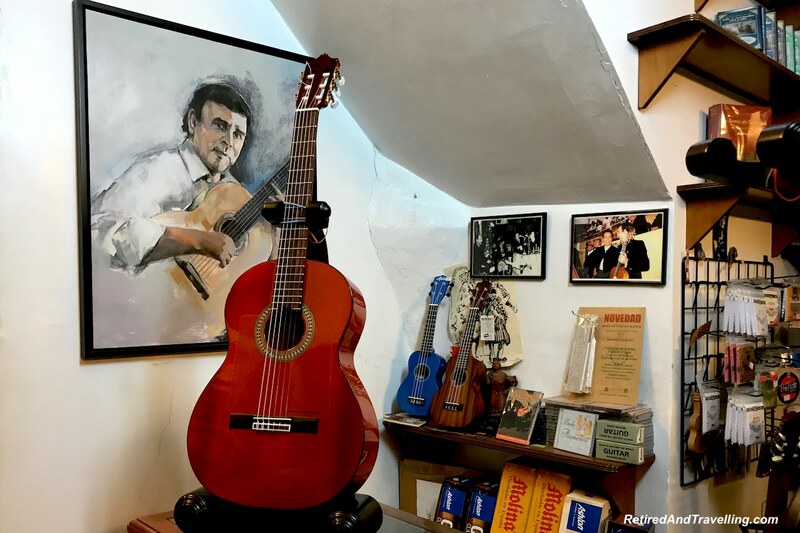 One of the stops we made was to the J. L. Postigo Guitarras guitar shop. One of the early masters of flamenco guitar opened this shop up. The majority of flamenco is done by solo dancers although some songs are done with couples. Skill and passion are both needed to make an excellent flamenco dancer. There is often a bit of improvisation done by the dancers as they interpret the music through their own personal experience. 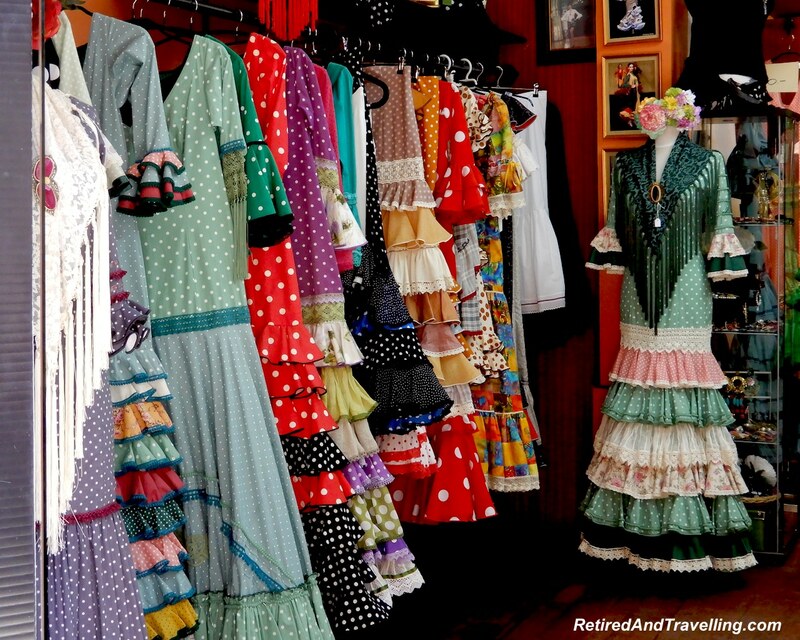 The traditional flamenco style dresses are not just for dancers. Dresses worn by women for the April Fair are like the flamenco dresses. A woman must wear one of these dresses to attend the fair. Some woman own 7 dresses, one for each day. And of course, there are tourist replicas if you are looking for a souvenir! The Triana area had been settled by gypsies. Flamenco singing has its roots in songs the gypsies used to communicate when they were working in the tin and silver mines. The words of flamenco talk about love and loss. Singers often modify the words with personal stories. 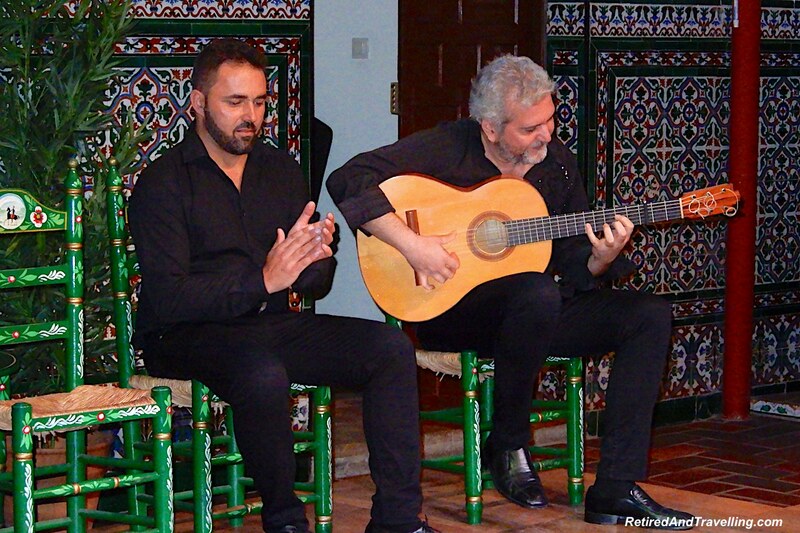 It was also noted that there is also some similarity to Islamic calls to prayer in the flamenco chanting. Our guide David showed us samples of lyrics since none of us was fluent in Spanish. Different areas in Spain all claim to be the origin of flamenco. Each area has a local flamenco dance that is the first dance done in a show. In Seville, the first dance is the Sevilliana. It would be a different first dance in Granada! 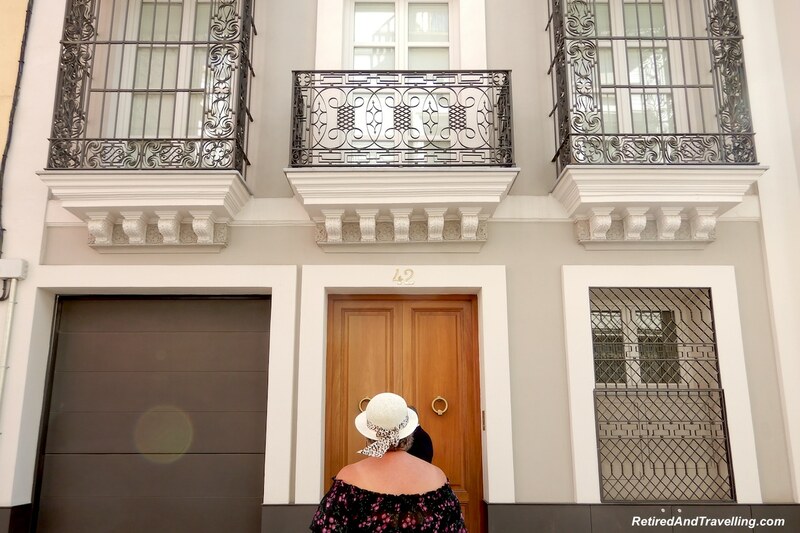 Our guide for the flamenco and food in Seville tour walked us through the narrow cobblestone streets of Seville. He stopped regularly to provide tidbits of information as we strolled. We knew exactly where we were when the Seville Cathedral came into sight. 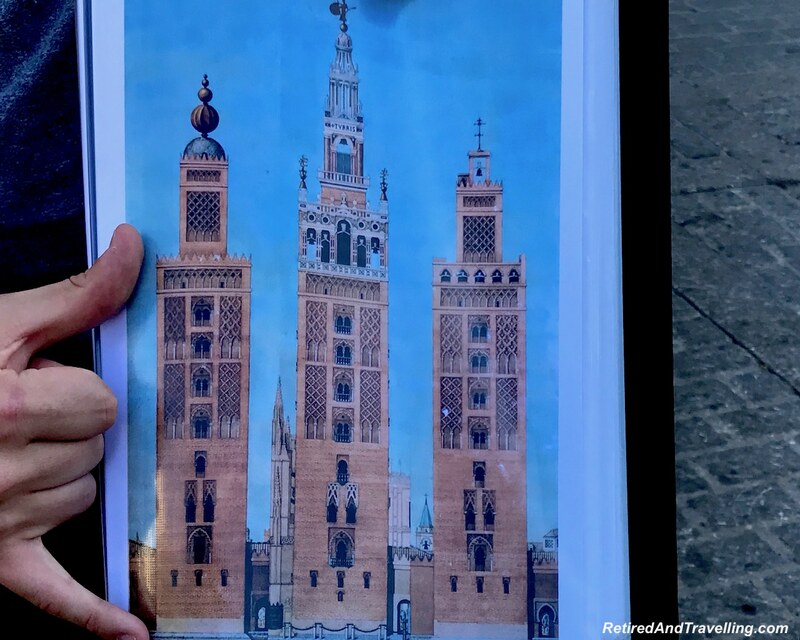 David pulled out his book and spent a few minutes talking about the history of the cathedral as shown through the iterations in design of the Giralda Tower. We often fell behind as we saw yet more interesting buildings that caught our eye. But we never lost sight of the group. 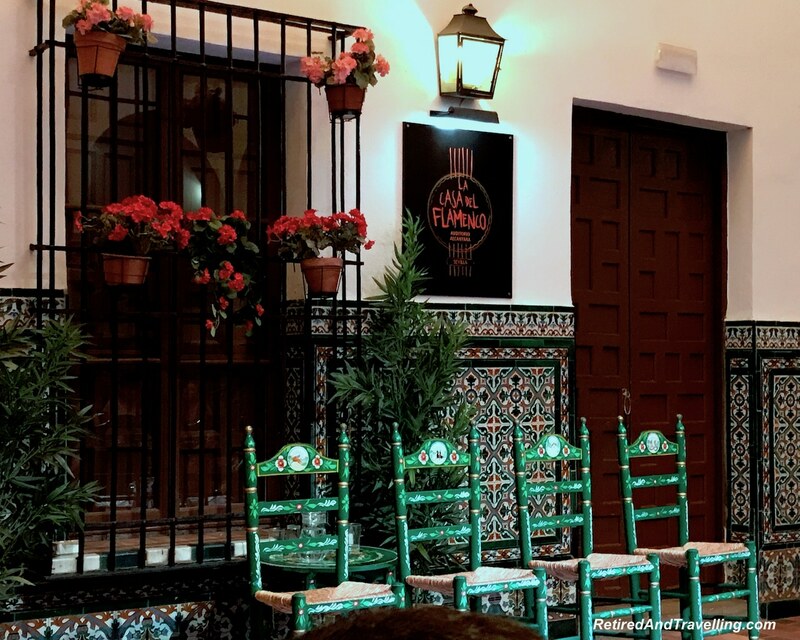 We were not missing flamenco and tapas in Seville! 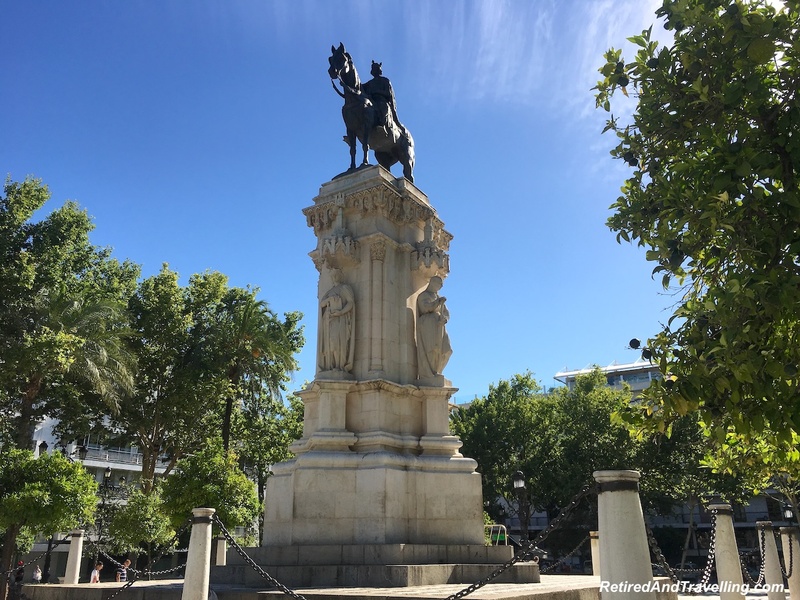 We had 3 different stops to eat and drink on our flamenco and food in Seville tour. At each stop we tried something a little different. 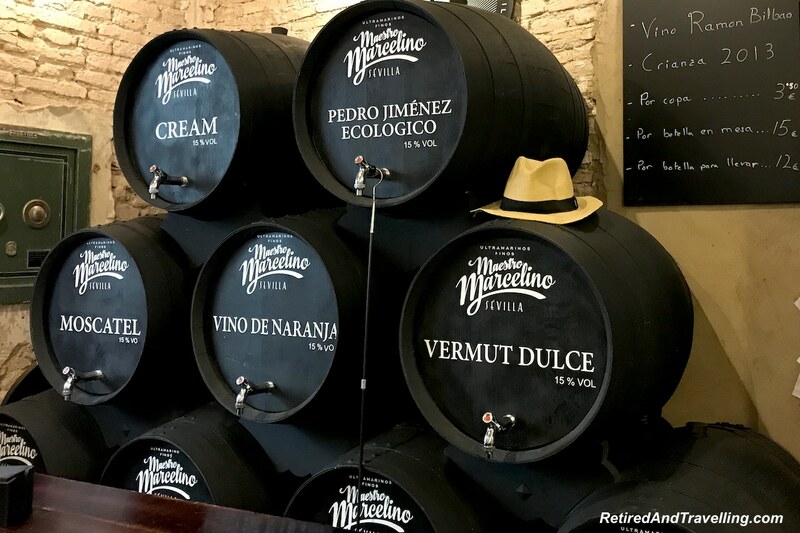 Our first stop was at Maestro Marcelino in the Jewish Quarter. The first drink that we tried was vermouth. It is apparently very different from Italian vermouth but I was not the expert on vermouth. 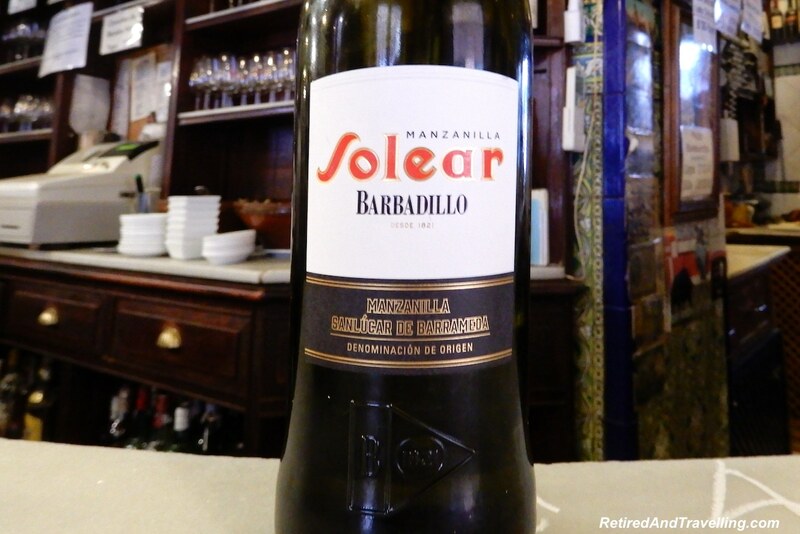 The second drink we tried at Las Teresas Bar in the Jewish quarter was manzanilla sherry. 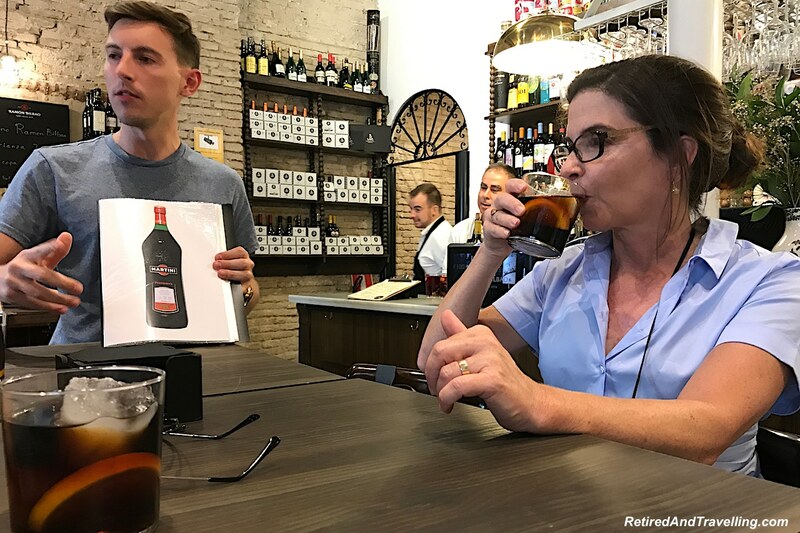 Much like for other specialty wines, real sherry can only come from one region in Spain (in the south by the Portugal border). 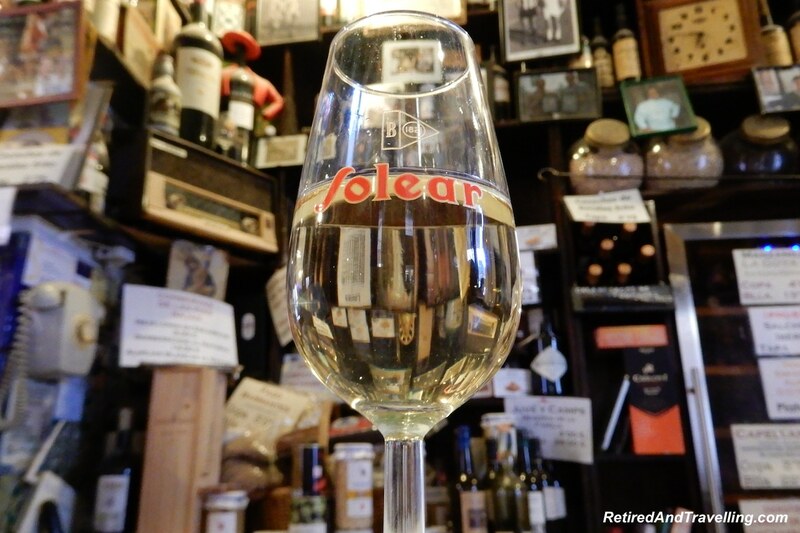 Sherry is produced primarily from the Palomino grape and fermented with a yeast found only in that region. At one end of the spectrum is a white sherry and at the other end you find the deep red-brown colour many people associate with sherry. We had our first sip of the sherry before we knew what we were trying. Most of us guessed it was some kind of grappa. 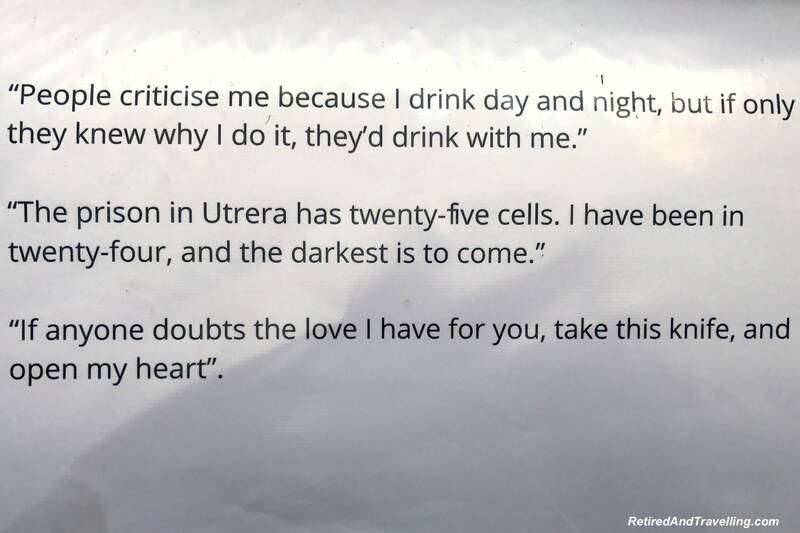 But in fact it was sherry. After we had tasted our food pairing, the sherry taste settled down and everyone agreed it was much better. Our final stop was at Sal Gorda after the flamenco show. We were provided with a wide list of white and red Spanish wines to try. Our tour guide David provided us with the defining characteristics of each wine and we each had two glasses. I tried a dry white for my first glass. It was ok. But the red wine I had for my second glass was outstanding! 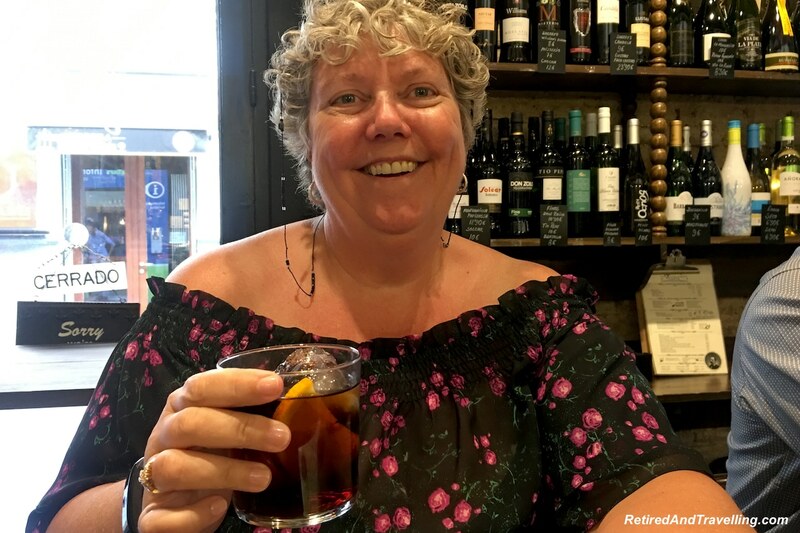 At each stop on our flamenco and food in Seville tour, we got a local drink and a large tapas serving. We did not go home hungry that night despite only having tapas! 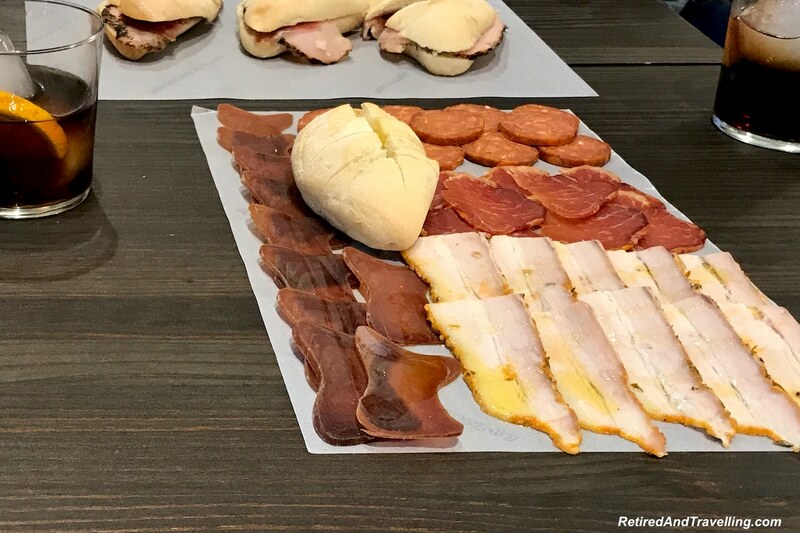 At the first stop with our vermouth we had a selection of different cured meats and a grilled pork loin sandwich. 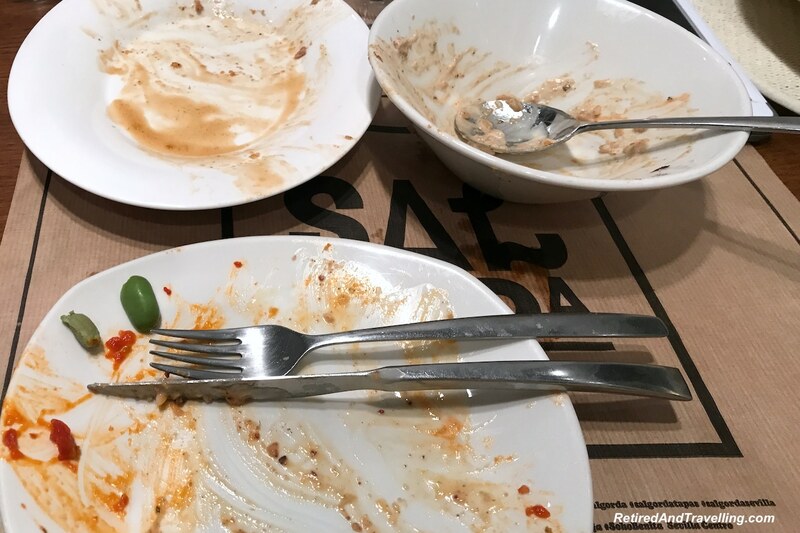 The tuna was exceptional. Being spice wimps, we passed on the chorizo sausage. 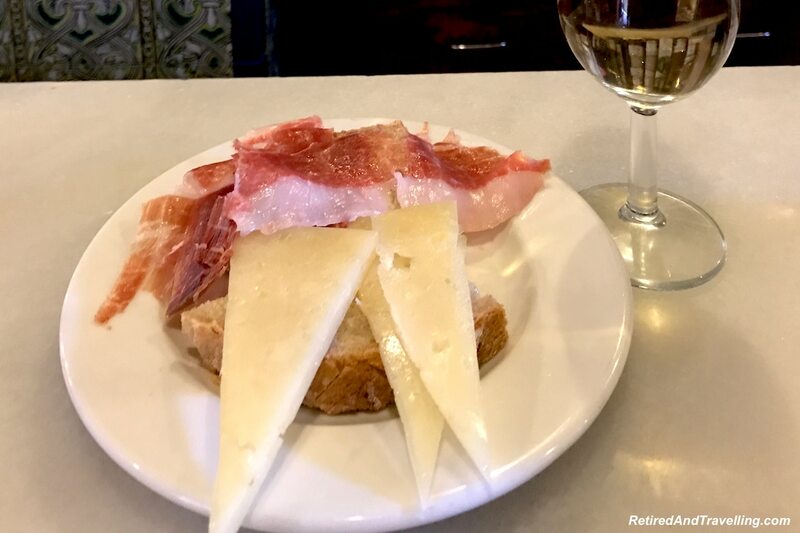 At our second stop, we had a selection of ham and aged sheep cheese with our sherry. 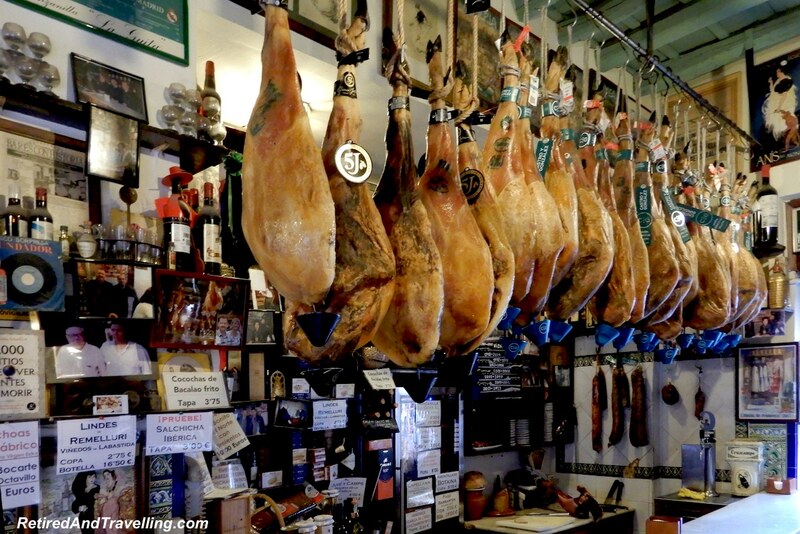 The Iberico ham is made from acorn-fed black pigs. It is much fattier than Serrano ham but far more tasty. If you are served Iberico ham, you should always be shown the black hoof to prove that it is truly Iberico ham. We had tasted this delicacy before but Las Teresas Bar had the smoothest version we have ever tasted. Like wine, there are ham regions with slight differences in the ham produced in each region. Our tour guide David answered our question about why ham was so popular in Spain. It allegedly went back to the Spanish Inquisition times. Jews would hang ham in their windows to try to make inspectors think that they were not really Jewish. In no time, ham became the most common meat available. For our final stop after the flamenco show, our tour guide David ordered 3 different tapas dishes. 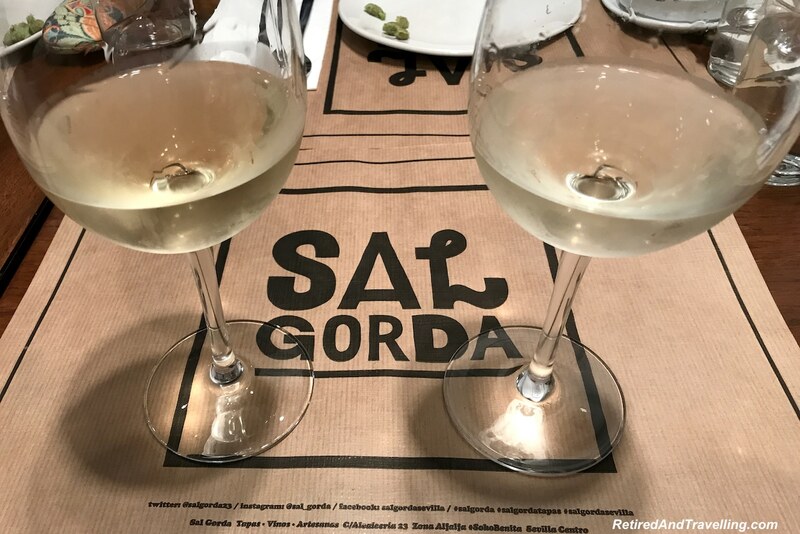 Sal Gorda is known for its fusion blend of traditional Spanish recipes with a twist. We had truffle risotto, a pork dish and stuffed cannelloni. All were quite delicious and not a drop was left when we finished. For dessert we got a refreshing custard. Passionfruit added just the right tang! 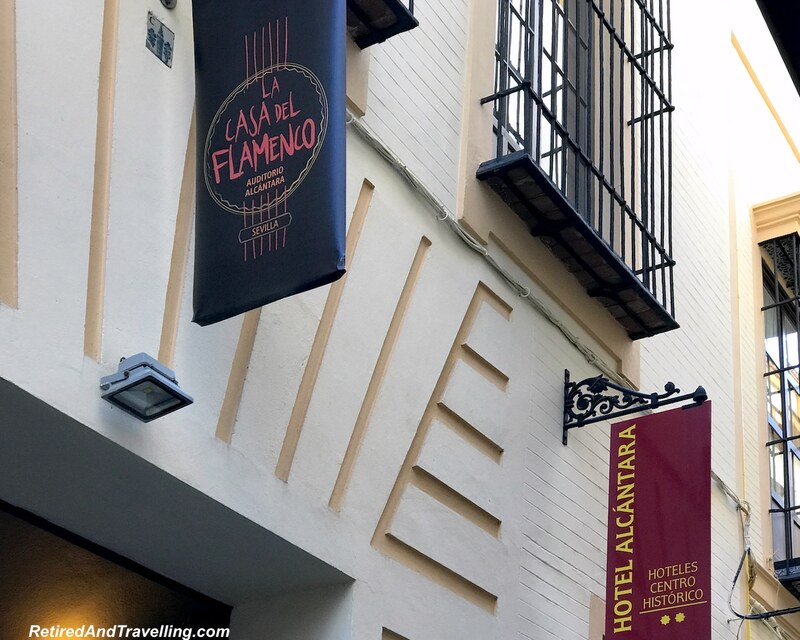 We saw our flamenco show at La Casa Del Flamenco in the Hotel Alcantara. The show was done in what was once a palatial residence dating back to the 15th century. The hotel owner was tired of guests asking for good flamenco and not being able to give a great recommendation. So he created his own flamenco venue. Artists change and mix so you are never sure who will be performing on a given night. Our guide had only seen 2 of the artists in our show before. The audience is expected to participate with clapping and shouting. Our guide David explained that when you feel the “duendé” moment overtake you with emotion (the hair stands up on the back of your neck) you should scream “Olé”. We certainly found many duendé moments throughout the show. It was a relatively small arena with only 3 rows of chairs in a circle. Everyone got a great view of the show. The central stage had 4 chairs for the performers. The acoustics in the room were excellent and this performance was one of the few in town that did not use microphones for the performers. It was a much more authentic sound! The show started with the Sevillana dance with both the male and female dancer. Both the male and the female dancer had solo dances. We got one guitar solo and one vocal solo. It offered a great range of flamenco and showcased the group. There were no pictures allowed during the show but for the last 5 minutes we could get our cameras out as the last movements were performed. We had a great night enjoying flamenco and food in Seville. David (our Devour Seville guide) did a great job of showing us Seville by night. He certainly showed his love for his adopted city. 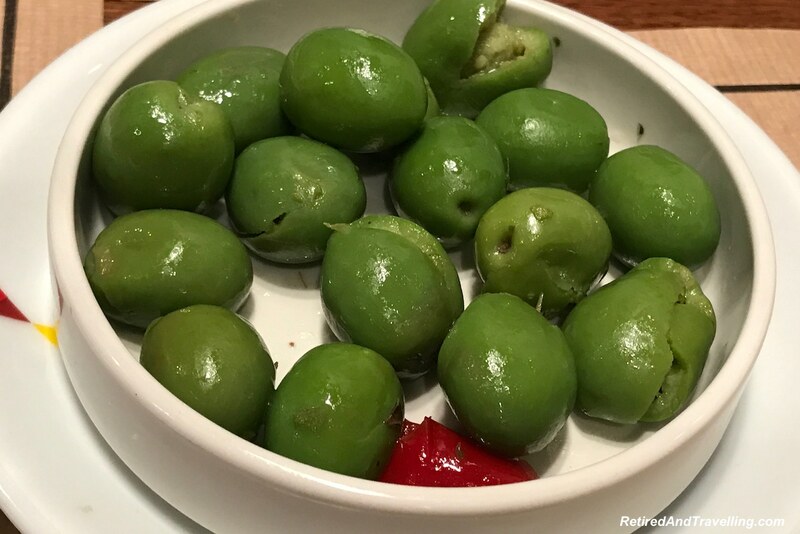 The Devour group has food tours in other cities in Spain. We would certainly try another tour if we find ourselves in one of their towns. 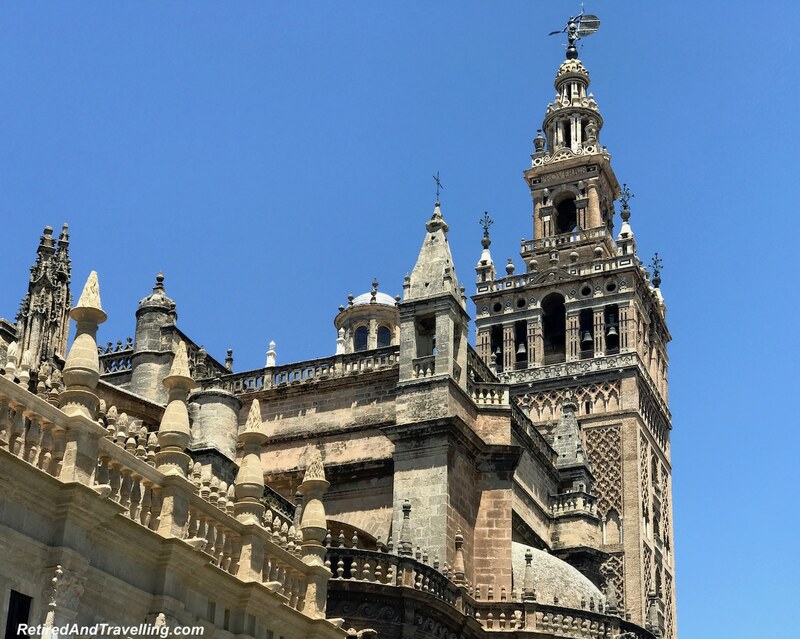 Finishing our 4 days in Seville with great food and authentic flamenco left us excited for our next stop in Cordoba, Spain. 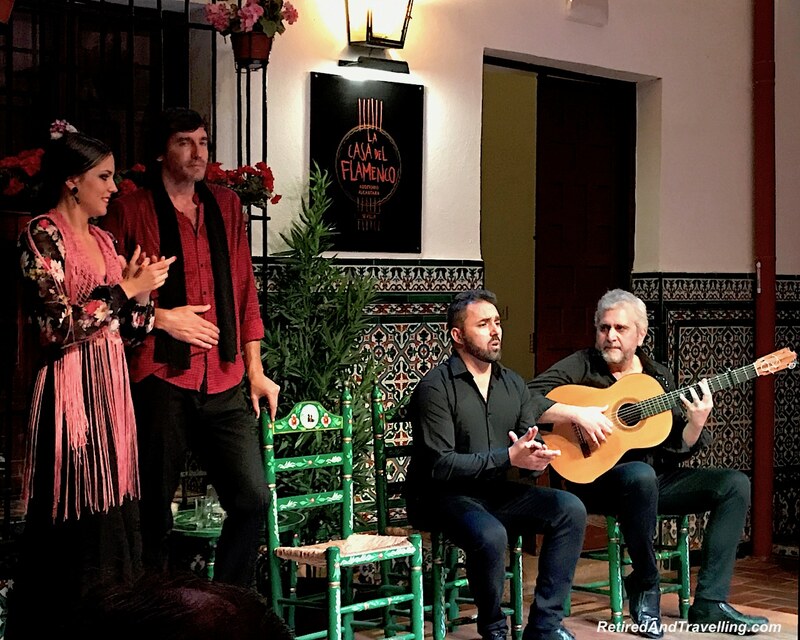 We would likely not see another flamenco performance but we would look for another authentic Andalusian experience in Cordoba! 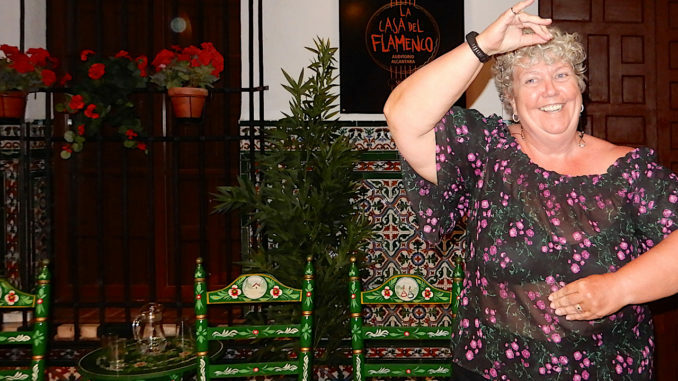 How did you enjoy flamenco and food in Seville? Did you do a formal tour and wander on your own?